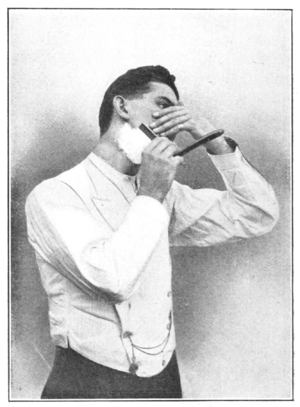 Illustration from Shaving Made Easy. How to shave the right side under the jaw. Ever wonder why so many men choose to have beards rather than go through the process of daily shaving? One reason leaps immediately to mind, the discomfort of shaving and the drying nature of many aftershaves leave men completely disinclined to endure the entire process. The good news is that there are many newer products on the market today that offer more comfort even during the after shaving process. There are new products in the forms of gels, crèmes, and lotions that promise comfort and relief from shaving while acting as moisturizes so your skin isn’t dried out as a result of the process. So ladies, if your man’s whiskers are becoming problematic, then you might suggest one of the newer aftershaves to your fellow. Another thing you want to keep in mind when suggesting a new or possibly improved aftershave to your man is the scent. Not all aftershaves are created equal and while some might have all the best properties to it, if the scent is one that you find offensive it might make those close moments somewhat unpleasant. Another thing to keep in mind about the scent of aftershaves is that the scents in the lotion forms linger longer than the alcohol based aftershaves. Also remember that while some women find a beard quite appealing, you still want proper grooming and shaping for your beard. This will require that you actually shave some parts of your face and neck. This means that you will still want to use aftershave in order to provide comfort to those areas, which have been stung by the razor. It’s never a bad idea to consider one of the newer formulas or scents, particularly if you have had issue with the scents and drying effects of previous aftershaves you have experimented with.